Most people who use Gmail casually end up having tons of unread emails in their Inbox or other labels. For instance, when somebody sends a breaking news email to a Google group I am part of, another 100 replies come in with thanks and cheers. After looking at one or two, I just tend to ignore any further emails coming to that thread. The result - I don't mark those emails as read and my Gmail inbox has more than 1000 unread mails. The Huge Unread Email Count Doesn't Make Sense. A lot of us tend to rely on the unread email count to check for new emails. But when the number grows too big, it becomes useless. And it really doesn't make sense to have hundreds of unread emails which you are not going to read any way. 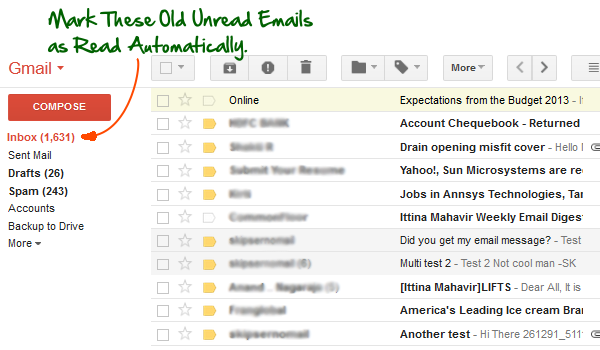 What you need is something like the Auto Sweep feature of outlook with sweeped mails being marked as read. Unfortunately there is no "Mark as read after N days" option in Gmail. But you can easily add this missing functionality with a simple trick. Marking Old Emails as Read Automatically. Open this Google Script and select "File->Make" a copy. This will make a private copy of the script in your Google Drive and open it. In the script, set values for MARK_AS_READ_AFTER_DAYS and LABEL_TO_MARK as per your requirement. Select "Run->Initialize" and grant required permissions. The script runs as your personal copy and nobody else will have access to any of your data. Now select "Run->Install" to install and start the script. That's it, you can now close the script window or tab. The Google script will continuously monitor for emails older than the number of days you specified and will mark them as read automatically. You can also stop marking emails any time by selecting "Run->Uninstall". Also see: Do You Track your Gmail Login activity. Awesome script, thanks! I'm new to Google Apps Scripting. On another script I'm using successfully, it's triggering once a day. Should I do the same for your script? Or does it just run constantly? Nevermind, I see now that you have triggering built in. Also, getTimeZone() has been deprecated. I changed over to getScriptTimeZone. Is it possible to change this script to mark mails after 5 minutes? Fed up with unread emails piling up your Gmail inbox? Automatically nold emails as read using this simple Google script.